Today's a good day for me, so why not review one of my favourite anime, Ookiku Furikabutte! A good anime doesn't always need a complex/ compelling story to be good, something simple and modest could have the potential to be just as entertaining. When I think about Ookiku Furikabutte I think about an anime that's simple yet fun to watch at the same time. Ookiku Furikabutte is an anime that revolves around baseball; and yes there are other great sports anime out there besides Haikyuu and Kuroko no Basket. No one in Ookiku Furikabutte has those animalistic abilities, like the ones you see in Haikyuu and Kuroko no Basket. So what makes Ookiku Furikabutte a good watch? 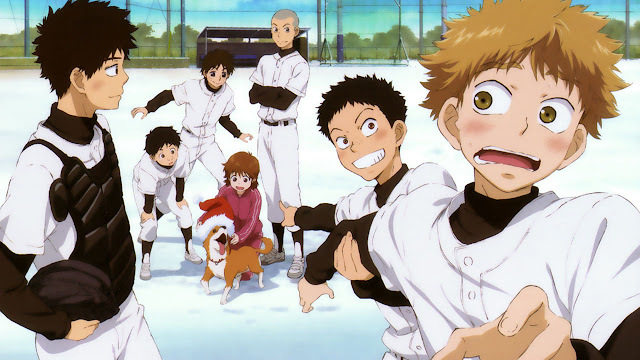 Also known as Big Windup, the anime follows a very timid boy named Mihashi and his experience as being part of the baseball team at Nishiura high. I've described the anime as being simplistic, and I'm not joking when I say that. The story simply follows the Nishiura baseball team playing a practice game and one tournament game within the first 25 episodes of the first season. Just hearing that Ookiku Furikabutte is an anime about a baseball team simply playing baseball sounds so bland- I can understand why the popularity is so low. There were times while watching the anime, where I just zoned out since it was kind of boring to be honest. But those gaps in between those moments of boredom was where the characters really made the anime fun and endearing to watch. Mihashi is one of our main characters, who happens to be one of my favourite male characters in anime. He's very timid, so socially awkward, and he makes these hilarious facial expressions which makes it kind of cute to watch. Then there's out other main character, Abe Takaya. He's like the backbone to the spineless Mihashi. Abe tends to be more blunt, rough, and often has to raise his voice to get his point across- he's almost like the opposite of Mihashi. Mihashi and Abe have this love-hate bromance thing going on that it's hilarious and delightful to see. Another thing that I feel like Ookiku Furikabutte does great is being able to tug on my heartstrings. Looking at Mihashi and his backstory I felt really happy for him watching him; he had a difficult experience in middle school and when we entered high school he met people like Abe and his teammates and he finally developed genuine friendships. My favourite episode was when it was Mihashi's birthday and he invited his teammates over to his house for a study session without them knowing it was his birthday until Mihashi's mother accidentally spilled the beans and busted him and things went from awkward to a very happy situation. I kind of feel sad that Ookiku Furikabutte doesn't get the recognition/ popularity I feel like it should get. It's rated very well over a lot of anime websites yet the popularity level isn't that high. Even the OST, OP and ED were great as well. So I'm not entirely sure why Big Windup isn't that popular, but maybe it's because the anime is too simplistic? Who knows. All I can say fro my perspective is that I enjoyed Ookiku Furikabutte a lot. If you're not into simplistic anime, don't bother with Ookiku Furikabutte, you will be bored out of your mind. Though if you want to watch a modest baseball anime about friendship, teamwork with a couple of laughs along the way and can bring a smile to your face, try out Ookiku Furikabutte. Thanks for reading my review, I hope you enjoyed reading it. Please leave a comment down below and share your thoughts if you've seen this anime already. I think baseball is boring itself. And if you tell me that there is boring and tedious moments in the plot, I will not watch the series even if you promise a really good light comedy. You don't even like Kuroko no Basket or Haikyuu?! My favorite scene is when Abe takes Mihashi's hand for the first time and then tears up with empathy for him and affirms his effort and commitment. All throughout Abe keeps touching his hand to check up on him and make sure he's ok. And it's peculiar because nobody asked him to do more than that one time of grabbing his hand to "learn all he needed to know about Mihashi" but he keeps doing it. Ah, I love that scene as well! Mihashi and Abe have the best friendship. Thank you for reading!